Born in San Diego, CA, Lana Lindsley has resided in Austin, TX for long enough to say “Cheers Y’all” while eating breakfast tacos, watching live music, or sharing fine whiskey with friends. Lana is the Diageo Bulleit Ambassador for TX and its surrounding southern regions. 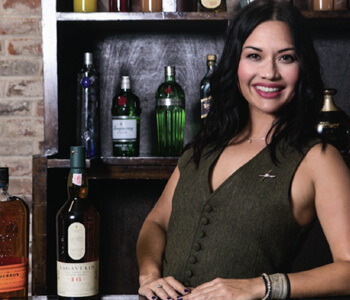 Brand advocate and educator, she has an extensive Diageo brown spirits background from serving as a member of the Masters of Whisky team and as a North American Whiskey Specialist. Working with a small Bulleit team at Proof Media Mix is a dream come true, combining her passion for KY Bourbon with innovative activations promoting culture, authenticity, friendship and creativity. She loves the way her team of builders and whiskey revivalists are able to cheerfully execute activations of any scale and have the talent to make it look easy. Lana is dedicated to education and distillation-history, heritage, production, maturation, bottling, stills, cooperage, and flavors thrill her to no end. She ardently believes there is a Bulleit Frontier Whiskey for every palate, and adores guiding new friends to discover their favorite.